It’s a nice feeling giving your kids a snack and knowing exactly what is in it. 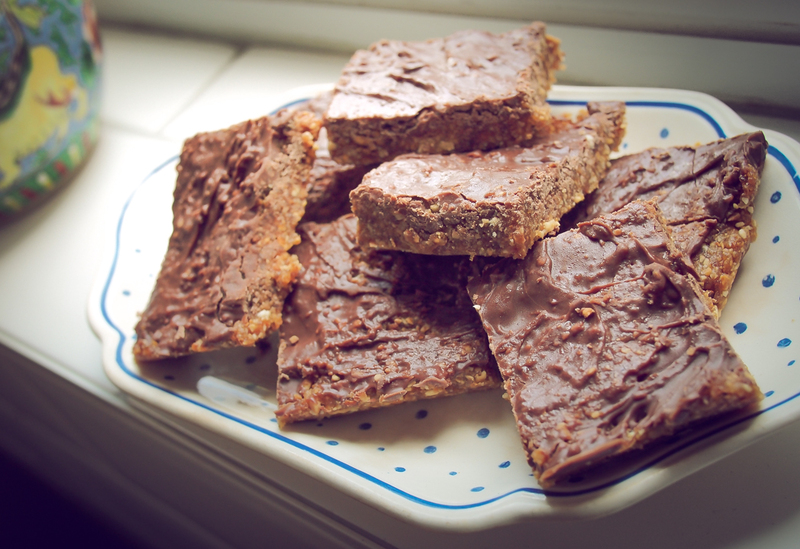 These nutritious yet moreish peanut and date bars contain only roasted peanuts, dates, a little honey and some chocolate on top, and are simple to make. Put the peanuts, dates and a good squeeze of honey in a food processor/blender and blend until the mixture is sticky and fine (you may need to do this in two batches). Cover a shallow square/rectangle shaped container with tin foil then press the mixture on to it until evenly dispersed. Melt the chocolate in the microwave (do this in short bursts to avoid burning) and pour and spread it evenly over the mixture. Refrigerate for a few hours then cut in to bars. Keep them in the fridge – they will last a few days! « Kulfi (Indian cardamom spiced ice cream) – no ice cream maker required! Surely kids loves this. These nutritious peanut and date bars contains roasted peanuts, dates, a little honey and some chocolate on top is heaven. Must a try.